First, let’s discuss the game called ‘Need For Speed’ published by EA. The advantage of this game is that it has a very short log in time. To turn left or right, you just shake the IPAD but! be careful not to drop it. This can also be considered a disadvantage of playing the game, plus, it can also make you feel a little dizzy. So I challenge you to practice a lot to reach higher levels of mastery. And don’t quit when you get a little dizzy. Second, the most popular iPhone game--- ‘FIELDRUNNER.’ There are no obvious differences between iPhone Games and IPAD Games. But FIELDRUNNER has a much faster action compared to Plant & Zombie, though. The goal of FIELDRUNNER is for the player to try to quickly manufacture more weapons to defeat their enemies. The victorious players win money after defeating them. 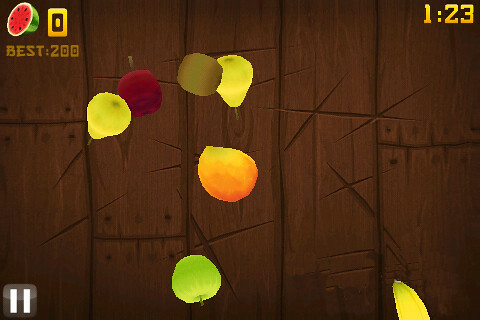 Finally, my fav game…: ‘Fruit Ninja’! I found a shortcut to getting higher scores while playing. If you shake your mouse quickly on the Stop Button at the bottom left corner of your computer screen, you can increase your scores and even get more continuous shooting opportunities too. The strategy for playing this game is for players to build a barrier to fight against the Fruit. For beginners, don’t worry if you can’t stop the attacking Fruit, you will have enough chances to shoot them when they are falling. Talk about your scores here with me and I will be happy to share a lot more strategies. 2. My high score is 100 in 1 minute. What’s your score for one and a half minutes? 1. Here a screenshot of my high score. The secret? 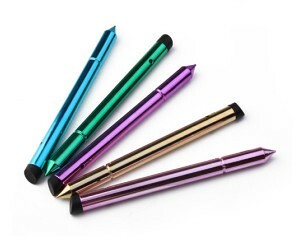 Use a stylus pen…! These apps look kinda fun!